How time flies! After two and a half years on the job (the normal term for an ambassador is three years), David Shear, U.S. Ambassador to Vietnam, has been tapped by President Obama to be the next Assistant Secretary of Defense for Asian and Pacific Security Affairs (APSA) in the Department of Defense. (This job change has already been added to his rather slim Wikipedia entry, including that important phrase “following Senate confirmation.”) As Diplopundit points out in this 13 January post, APSA is responsible for oversight of security cooperation programs and foreign military sales programs (my italics) within the regions under its supervision. It covers East Asia, South & Southeast Asia and Afghanistan, Pakistan and Central Asia. Speaking of foreign military sales programs, the U.S. was the world’s top arms exporter in 2012 at 39% of $73 billion, or $28.5 billion. Russia was a distant second at 14%, followed by France at 6% and all other countries at 41%. According to a recent report from IHS Jane’s, the U.S. may ease export restrictions against Vietnam and Myanmar, paving the way for military sales. But I digress… kind of. 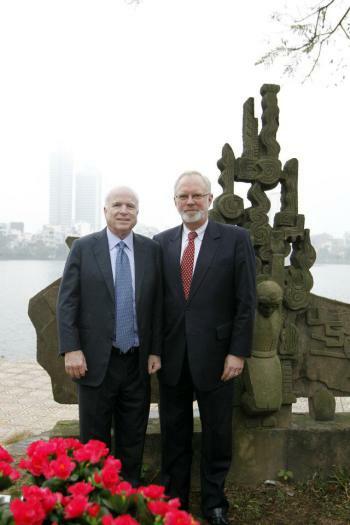 As a side note, the lake behind where David Shear and John McCain are standing is Trúc Bạch Lake in Hanoi, into which McCain parachuted after being shot down by an anti-aircraft missile on 26 October 1967. He was on a mission to bomb a local power plant. I’d be interested in hearing from some readers who also happen to be students of Vietnam about what they see as Ambassador Shear’s major achievements since he arrived in August 2011. His predecessor, Michael Michalak, was probably best known for educational exchange. What will David Shear’s legacy be, if any?